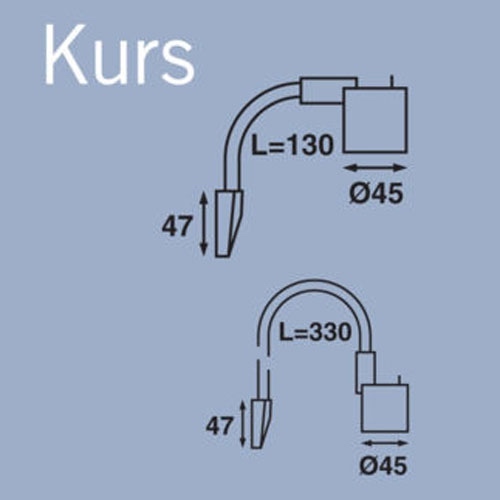 The Kurs is a high quality 12v LED reading light from Sweden's Frilight. It has a flexible stem to allow directing of the light for the most effective and comfortable use. Choice of two lengths of stem and two colours, matt silver and black. This order page is for the silver, 330mm stem version. For maximum flexibility and ease of use the Kurs has an on-off switch on the head unit which also has a swivel and tilt capability, making it a very convenient reading light for campervans, motorhomes, caravans and boats. It is fitted with wires (approx 600mm) for connecting into a 12v supply circuit. 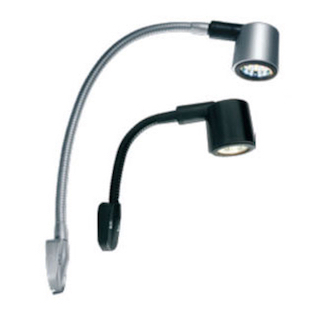 The Kurs reading light is available with a choice of two lengths of flexible stem. Both sizes of the Kurs LED reading light are available in a choice of colour - either matt silver or black.